Train Simulator 2016 is extreme, as developer Dovetail Games notes no fewer than five times in today's announcement of its launch on Steam. 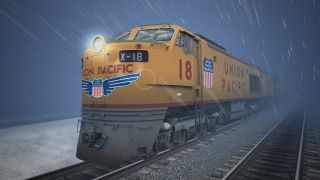 Foremost among the game's extremism, going by this "Get ready for the extreme" trailer, is the inclusion of the famous Union Pacific Gas Turbine-Electric Locomotives, which were driven by what Wikipedia says "are the most powerful prime movers ever installed in any North American locomotive." But perhaps more importantly from a gameplay perspective, the new edition will also see the game move to a "live service" model, with regular updates and free monthly add-ons for owners. The GTELs debuted in the late 1940s and ran through the 50s and 60s before being phased out of service. They were tremendously powerful but suffered from poor fuel economy, which became increasingly problematic as uses and demand for the Bunker C heavy fuel oil it used became more widespread, and they were high-maintenance machines as well. The last run of a Union Pacific GTEL took place on December 26, 1969. But now it's back, digitally at least, in Train Simulator 2016, which features other "historically significant" trains including the BR 155 on the West Rhine route from Cologe to Koblenz, and the GWR Castle Class running from Exeter to Kingswear on the Riviera Line. The game also features a new "Drive Assist" system which uses real-time prompts and more user-friendly introductions and scenarios to simplify the process of keeping these mighty machines moving. The biggest change, however, is the move from annual updates to a "live service," which will provide fixes and updates throughout the year. As part of that, owners of the game will receive free monthly add-ons for the first six months of Train Sim's release, beginning in October. I'm not a train man myself, but I do really like this trailer, because I think it very handily sums up many truths about Train Simulator 2016, and the niche simulator genre as a whole. Cracking thunder. Pounding heart. The engine screams as the green light drops, black smoke spewing from the yawning exhaust like the burning breath of a roaring dragon. And then slowly—slowly—the train inches forward. See you in Sioux City in 14 hours!